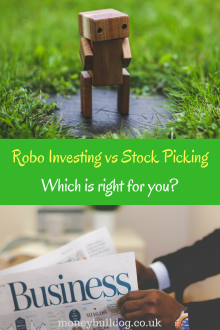 Robo Investing vs Stock Picking – Which is right for you? With online robo advisors now starting to gain real exposure on the UK investment scene, many people are wondering whether they would be better off investing their money with one of these investment services or should they go down the route of picking their own stocks instead? If this is a question that you are asking yourself right now then here are a few questions for you to consider before deciding between automated investing or picking your own stocks. The first thing you need to consider when deciding between robo investing and stock picking is what you are looking to achieve from your investment journey? Are you looking to take a few risks and possibly get in early on a killer share like an Apple, an Amazon or a Berkshire Hathaway, for example, in the hope of becoming a stock market millionaire? If so, then you are probably going to be better off doing some research on how to pick the right shares* and then trading through a standard UK share dealing account or a Stocks and Shares ISA that allows you to have full control over the shares you invest in. On the other hand, if you are investing with a goal of steady and sustainable growth, then automating your investments through a robo-advisor like Wealthsimple* – which is a UK alternative to Betterment – might allow you to achieve this goal with less risk attached than if you were to pick your own shares with very little knowledge on how to correctly balance an investment portfolio. Of course, we should mention here that there is a risk of losing your initial investment whichever route you choose to go down, as stock markets can rise as well as fall. The next thing you will want to give thought to is how much free time you have available to you? Building a portfolio which will stand the test of time and having the time available to regularly review it and make any necessary adjustments will all take up your precious time. If you don’t have much free time at your disposal, then automating your investments through a robo advisor might enable you to enjoy the potential benefits of stock market investing without having to worry about the time investment that would be needed to build and maintain your own portfolio of stocks and shares. How much spare cash do you have to invest? Our final point to consider involves the amount of money you have available to invest on a regular basis. Building your own portfolio of stocks and shares through an online share trading account can be fun and exciting, but it can also be quite costly. This is because each time you make a trade, you will have to pay a brokerage fee and in the UK you will also have to pay stamp duty on the value of the trade. This can mean that any gains that you make on your trades can quickly be eaten up by trading fees if you only have a small amount of money to invest each time. If this is the case for you, then investing through a robo advisor could again make sense, as you will only be charged a small annual management fee on the value of your portfolio, rather than being charged for each individual trade. To sum all of this up, if you are looking to make a lot of money by finding a killer share before its value skyrockets, then you would probably be better off opening a standard online share dealing account* or even a Stocks and Shares ISA, specifically an ISA which will allow you to pick your own shares. You should be prepared to spend time doing plenty of research before you buy into a company, and be sure to keep an eye on your portfolio to make any needed adjustments. Don’t fall into the trap of panic buying or selling, though. You will also want to make sure that you are making big enough trades to make your investments worthwhile after trading fees have been factored in. If, on the other hand, you are more interested in steady and long-term growth and you don’t really have the time or desire to spend hours researching companies, or if you want to invest small amounts of money but on a regular basis without trading fees eating up all of your gains, then investing through a robo advisor might well be the perfect option for you. Why Buy Shares Through a Stocks and Shares ISA? How to invest when you really don’t have a clue! Is It Time to Change Your Stock Broker?